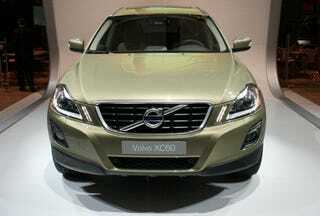 Remember the Volvo XC60 we showed you at the Geneva Motor Show? This new Sport Utility Crossover (SUX) is here in the states, but with some major differences. First, it'll be sold in North American. Second, no diesels. The end. The global version has two turbodiesels (the D5 producing 185 HP and the 2.4D with 163 HP), but we'll merely be getting the 285 HP turbocharged T6 V6. This is a big model for Volvo, with the company planning to sell as much as half of the 50,000 initially built in the United States. Differing it from other vehicles in the segment, AWD will be standard on all models and the new XC60 has an auto breaking features. Full press release below the jump. "This is not only the safest Volvo ever. If you ask me, it's also the most stunning. Not a bad combination, is it?" says Volvo Cars President and CEO Fredrik Arp. in March, with the first cars reaching dealers in Europe in autumn 2008.